Okay, so we got a little respite from Steve’s diet with the beet and tangerine salad in my last posting. I obviously made that before he went on this diet. Hope you will try it as I know you’ll love it! His diet of no garlic, onions, tomatoes or citrus is really hard for me. He can’t even have chocolate for dessert! So upcoming entertaining will be challenging. I must admit, however, that each night, my kitchen floor is much cleaner. Why? There’s no little bits of onion or garlic skin dancing around. But really, I’d gladly have them back and pull out the old dustbuster each night. So my two new favorite go-to seasonings have been herbs de Provence and fresh ginger! I like to slowly melt the ginger, like you would garlic, before sautéing it with vegetables. This particular night, I again had vegetables begging to be used so I did a drawer clean-up and it was delicious!! I combined some oven-roasted ones with sautéed ginger and cabbage and it was truly amazing. Here’s to all my vegetarian readers! 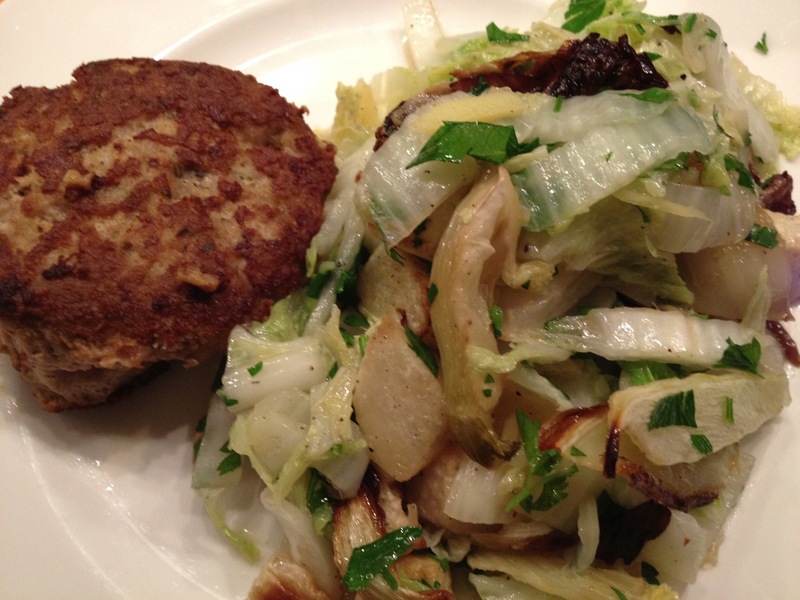 The turnips will be sweet, the cabbage adds a little crunch, the fennel, interesting flavor and radicchio adds some bite. All interesting, satisfying and delicious. Not to mention, also good for you! Preheat oven to 375 degrees. Pile your turnips, fennel and radicchio in the middle of a rimmed baking sheet. Drizzle with the olive oil, salt and pepper to taste and toss well. Roast for about 25 minutes until the turnips are fork tender. Be sure to toss halfway through so they brown evenly. Keep warm. Meanwhile, warm the 2 tbs. olive oil for the sautéed vegetables. Add ginger and cover to sauté slowly, over low heat for 15 minutes. 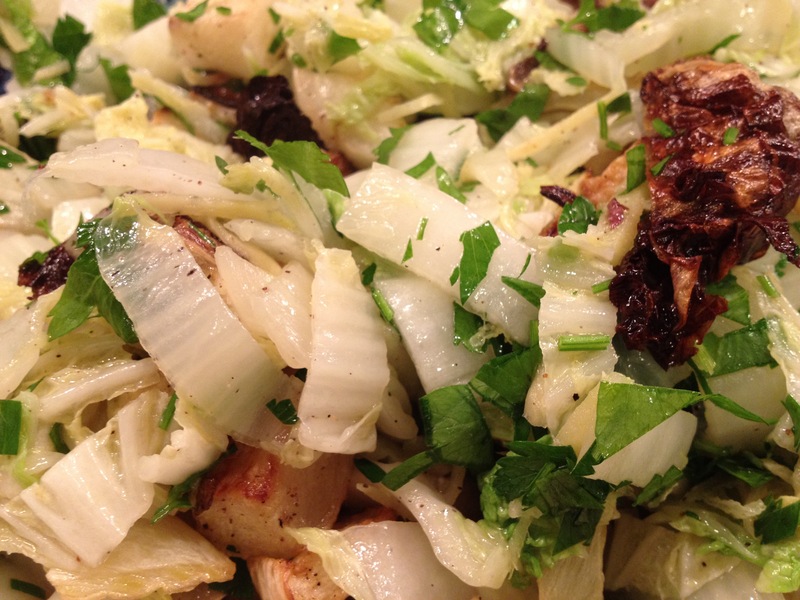 Add the thick pieces from the bottom of the cabbage, cover again for 5 – 7 minutes until they are tender. Then remove the cover, raise the heat and add the rest of the cabbage, salt and pepper to taste, tossing quickly until crisp tender, about 1 – 2 minutes. Turn into a large bowl, add the roasted vegetables, all their juices and half of the chopped parsley, and toss all to combine with two large spoons. Sprinkle the remaining parsley on top and serve. Now in the bowl you will have a lot of liquid as cabbage has a lot of water in it so serve this with a slotted spoon. Combine turkey, egg, panko, herbes de Provence, salt and pepper. Mix well but lightly with your hands and form into 6 patties. Do not pack tightly. Heat olive oil until shimmering but not smoking. 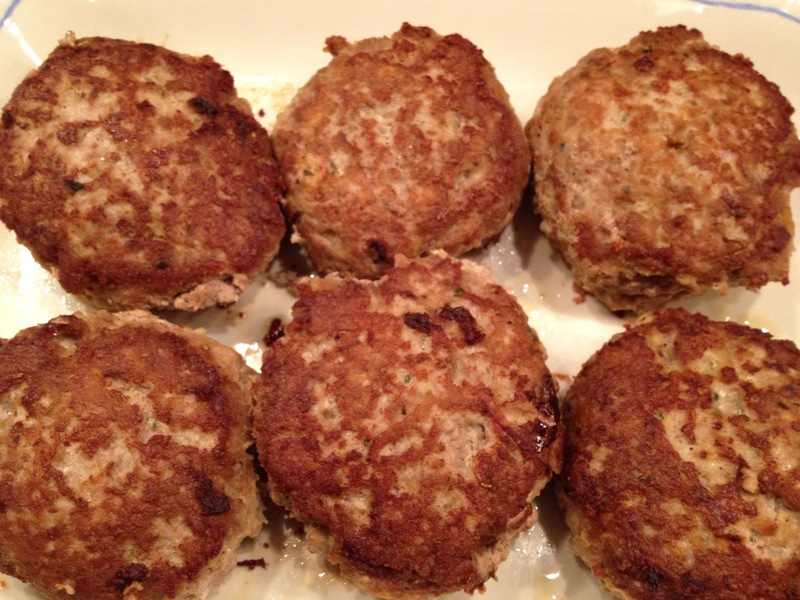 Add patties, lower heat a little and sauté 4 – 5 minutes on each side until done.